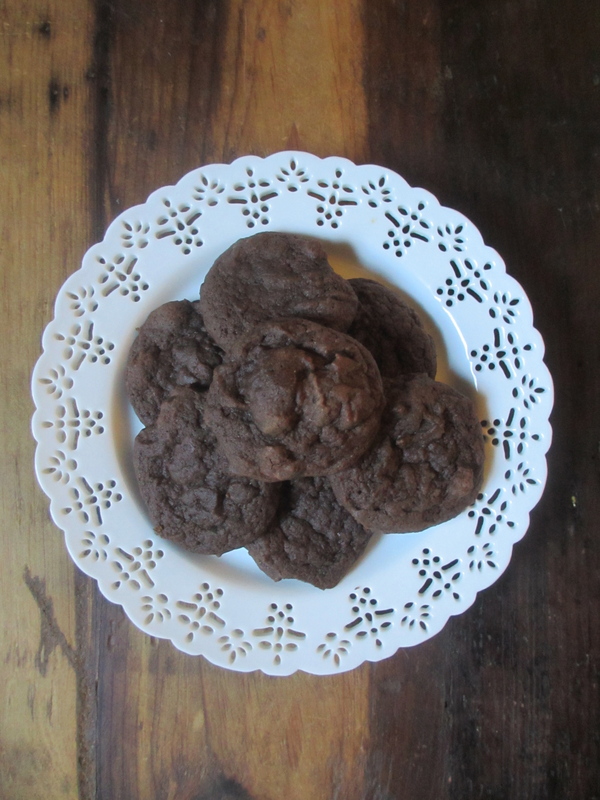 These cookies may just be the perfect solution to a chocolate craving. They’re rich but still light, i.e., you won’t feel guilty when you go back for seconds—or thirds. No judgement here! When I developed the recipe I decided to I incorporated a bit of crème fraîche that I had taking up space in my fridge. After all, tangy crème fraîche usually takes other foods I add it to up a level (remember my favorite onion dip?). 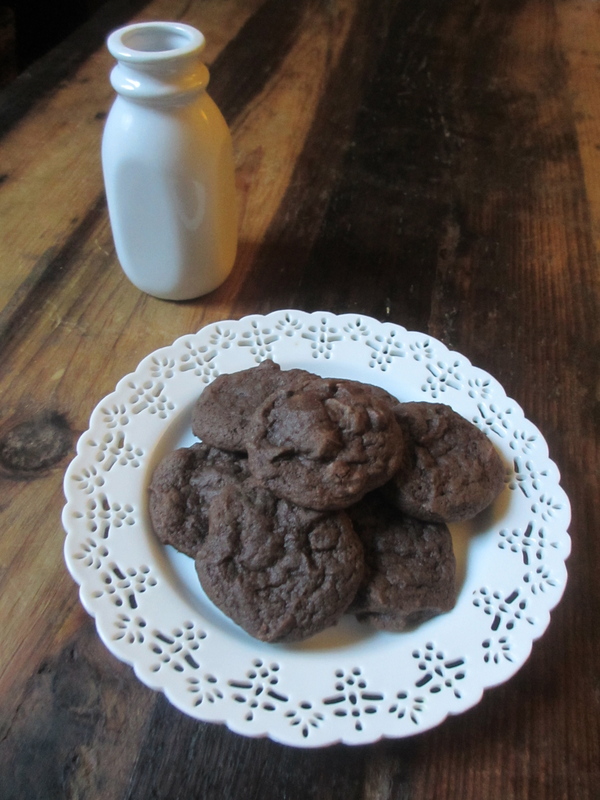 The result was a moist cookie that was full of chocolaty goodness but wasn’t dense or overloaded like so many are. I’ve made several batches and fall for them more and more each time. See for yourself. 1. In a large bowl or in a stand mixer, cream together the butter, crème fraîche, sugar and brown sugar. Mix for 2 to 3 minutes or until fluffy. Add in the eggs and mix to combine. 2. In a medium bowl, combine the flour, cocoa powder, salt and baking soda. Add dry ingredients to the wet in two batches, mixing until completely combined each time. Add the vanilla extract and mix until just combined. Fold in the chocolate chunks and chocolate chips. Cover the bowl with plastic wrap and chill for 30 minutes. 3. Preheat oven to 350°F. Spoon dough onto a parchment paper-lined baking sheet in heaping tablespoonfuls. Space cookies at least 2.5-inches apart. Bake for 7 to 9 minutes or until almost set in the middle. Remove from oven and let cool on baking sheet for 1 to 2 minutes, then carefully transfer to a wire rack to cool completely. Repeat with remaining dough. SWWU TIp 1: Of course these cookies are delicious when you eat them right out of the oven, but I found the flavor to be at its peak a day later. Store in an airtight container for up to a week. They won’t last that long though. SWWU Tip 2: These cookies are very moist and fragile when they come out of the oven. Make sure you let them set a bit on the warm pan as directed, then use your thinnest spatula to transfer them to a wire rack to continue cooling. They will firm up as they sit. This entry was posted in In the Kitchen and tagged @SWWUblog, chocolate, cookie, cookies, crème fraîche, dessert, double chocolate, guilty pleasures, homemade vanilla extract, in the kitchen, party desserts, recipe by Something We Whipped Up. Bookmark the permalink. Oh man I need these to feed my chocolate craving at the moment!